An article that I contributed to has been posted over at HorrorBlips.com today. 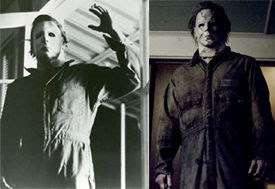 Robyn asks the question, which incarnation of Michael Myers is the scariest, John Carpenter's or Rob Zombie's? As you can no doubt guess, my decision was fairly obvious, but click on the image below to see what the consensus was.